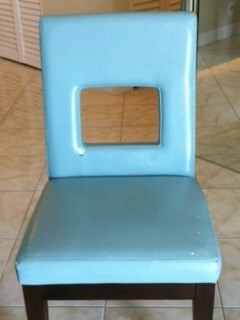 I am trying to find a way to repair my dining room vinyl chairs. I am looking for stick on vinyl for covering my chairs. I have a soft vinyl upholstered dining chairs (6) and they are worn at the edges down to the cloth, not to mention the appearance. It is now flaking and peeling where there is most use. Underneath is a soft fabric. I just want to find a soft stick on vinyl to recover them. The color on 4 of them is something like a dark chocolate brown. And the other 2 are a sky blue color, as per the attached picture. I live in Hollywood, Florida and I'm on a very restricted budget. Thanks for your time and consideration. Have you tried Dollar General or Family Dollar? They usually carry a fair variety of self-adhesive Contact Paper (or an equivalent). Not sure how soft it will be though but at $1-3 per roll it's worth a try. The instructions are simple and the photos walk you through it. This is a project you could sew by hand if you don't have a machine.